Review: King Gwang-hae was the only king during the Joseon dynasty who voiced criticism about China's Ming dynasty, Korea was a vassal state of China at that time, and implemented a fair tax system. However, opinions about that king's reputation differ. Especially mysterious is that in the chronicles of the king's rulership two weeks are missing. "Masquerade" is a period film that tries to give an explanation to that fact and this especially at the beginning in an unusually funny way. Later on the movie turns out to be a drama as well. Thanks to a great cast and wonderful sets "Masquerade" is engaging at almost any time. Never before did you get an insight look into the life at Korean royal court in such an entertaining fashion. "Masquerade" is surprisingly funny. This most of all results from the ridiculous rules of royal life. Ha-seon has to accustom himself to many new things, among them having to sit one the "throne" in front of an audience and his subordinates complimenting him on his big achievement. The result of his efforts are then brought to the king's personal physician, who doesn't just test the royal excrement in regards to texture and odor... All of this could have simply looked cheap, but it in fact doesn't. This is the achievement of the great actors. 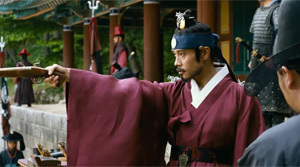 Lee Byung-hun ( "A Bittersweet Life", "I Saw the Devil") was at first worried that he couldn't master this at times very comedic role, but he in fact delivers one of his best portrayals to date. Furthermore, Lee takes on three roles at the same time. That of the king, then Ha-seon and being latter one he also needs to play the king. He masters all of this with flying colors, yet he also gets a lot of assistance from the supporting actors as well. Most of all Ryoo Seung-ryong ("All About my Wife", "War of the Arrows") shines as an actor once again. His character counts among those in the know and isn't happy at all about having to pretend to be loyal to his king, a man he constantly has to put in his place - and yet Ha-seon eventually pursues his own policy. However, the minister has his heart in the right place and that makes him so likeable despite his sternness. There would be a lot to say about the rest of the cast, too, but in summary there is not a single miscast. Director Choo Chang-min ("Lost in Love") tells his story in an outstanding way, which is especially apparent against the background that the plot around a doppelganger who has to carry out the duties of a king is extremely hackneyed - it never really feels that way. Maybe that is also because of the story playing during the Joseon dynasty and "Masquerade" being one of the few period films that manage to radiate a certain magic which exceeds the unusually high entertainment value of the movie. The sets and costumes are fantastic, the pictures are beautifully composed and the soundtrack is very pleasant. Carrying negative weight is that Choo is steering his work into the melodramatic at the end, something that also needs to be expected from a Korean movie. The ending is also a bit disappointing as a whole. Without spoiling too much, Ha-seon's time as a king doesn't seem to have changed his character. 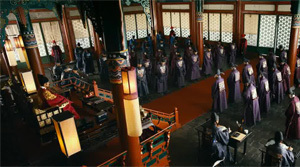 Additionally, the character of the king remains somewhat shallow, even the more as there are continuous hints that he wasn't so different from Ha-seon back in the day and apparently only slowly became a despot thanks to his advisors. If there had been a bigger focus on this aspect of the story the ending wouldn't just have felt more round out but also other aspects would have been more clear. The way it is the movie sadly loses ground and meaning at the end, yes it actually almost becomes meaningless at the last minute. Fortunately, that doesn't change "Masquerade" being a really well done period film with a lot of humor.